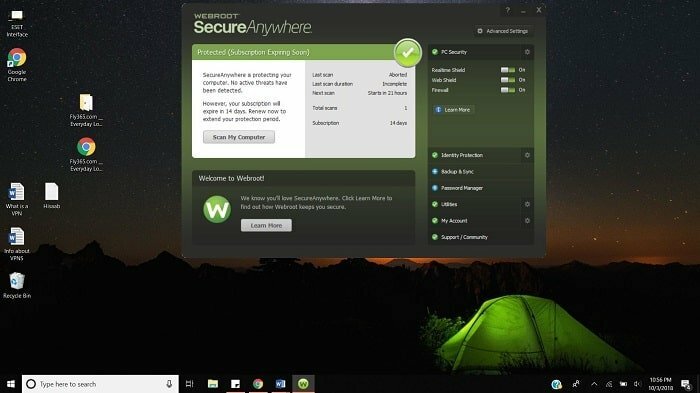 Bitdefender or Webroot, which antivirus software is a better option in 2019? Read this in-depth Bitdefender versus Webroot comparison to make a smart decision. In today’s world, you need reliable antivirus protection to protect your devices against a myriad of digital threats; ransomware, viruses, worms, botnets, spyware, just to name a few. Do you know over 800 million malware samples surfaced in 2018? You can no longer take your digital security and privacy for granted. At the same time, skimping for free antivirus can often lead you to assume that you’re protected, when in reality you’re actually just as vulnerable as before. Therefore, we recommend investing in a sophisticated antivirus suite, like Bitdefender Total Security 2019, for ultimate protection. Below, we have looked at two popular antivirus software in the market, Bitdefender and Webroot. We looked at all the major aspects of both software so you don’t have to do all the research yourself. In a hurry? Take a look at our quick rundown to see the category results and get a snapshot of how each company compares in each aspect. Winner: Bitdefender. Bitdefender offers more features/utilities in its security suites than Webroot. Winner: Bitdefender. In independent tests, Bitdefender showed much better anti-malware results than Webroot. Winner: Bitdefender. 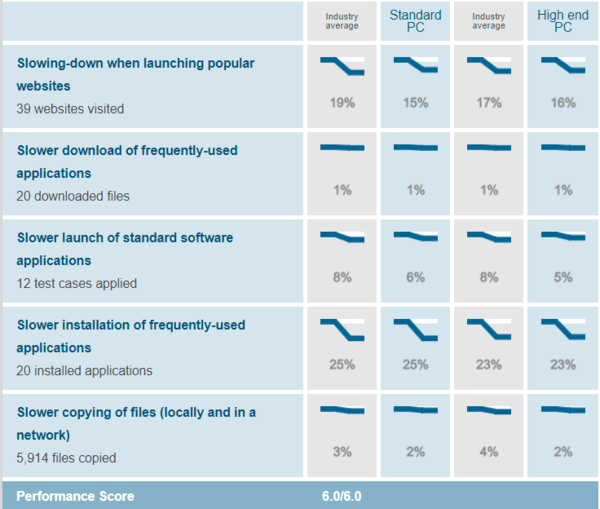 Independent tests prove that Bitdefender is better than Webroot in terms of the impact on system performance. Winner: Both. Different people have different preferences, so it’s a tie in this category. Winner: Bitdefender. Bitdefender is cheaper than Webroot at every tier of coverage. Winner: Both. Both companies have comparable customer relations according to two different reputable sites. Webroot is competitive, but Bitdefender offers a more comprehensive feature-set and better malware protection with minimal impact on system performance. Also, Bitdefender offers better value for money than Webroot. Now, let‘s go into the details. First, let’s look at what Bitdefender offers. Bitdefender Free Edition is the company’s limited freeware for the Windows platform. It provides basic defense against malware but lacks advanced security features and essential utilities that have become mainstream tools in modern security suites. The first paid security suite is Bitdefender Antivirus Plus 2019, which is only compatible with PCs. This package offers a comprehensive malware scanner to eliminate even the most advanced malware threats. In addition, the suite offers a password manager that securely stores all your passwords to provides hassle-free logins, a file shredding utility to shred sensitive files, and a limited VPN for anonymous browsing. The Anti-Fraud tool to protect against fraudulent/phishing websites is also part of the suite. Another level up is Bitdefender Internet Security 2019, another Windows-only suite. In addition to all the features and utilities that are found in the “Plus” suite, this package comes with a smart two-way firewall (monitors network traffic and blocks attacks), the File Vault feature (creates virtual drives on your computer where you can store confidential files), and a webcam protector. Parental control features are also part of this suite. These help you control what your kids see online and how much time they can spend on their devices. A single license of this suite protects five PCs. 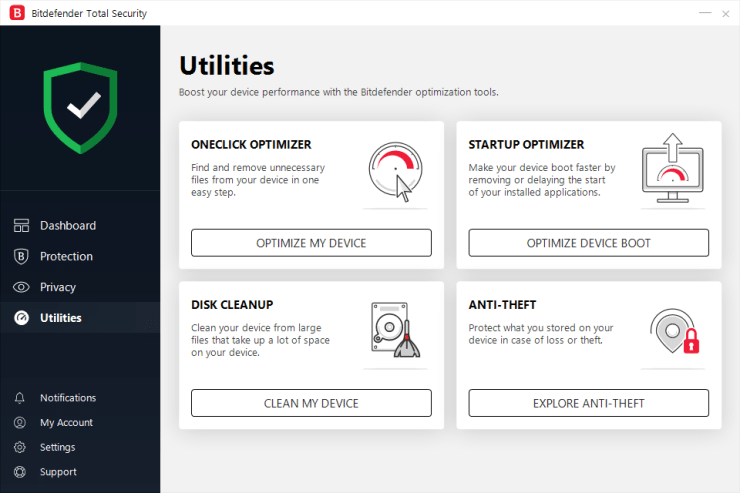 Finally, Bitdefender Total Security 2019 — which is compatible with PCs, Macs, and smartphones — is the company’s most popular security package. This package includes everything that’s found in the previous packages, plus the useful Anti-theft module that can alert you to the location of a lost or stolen device. A comprehensive system optimization module is also part of the suite. These features optimize your system performance and clean up junk files that occupy unnecessary space. A single license of this suite protects up to 5 devices for a year, with the option to add more. If you need to protect over five devices, we highly recommend Bitdefender Family Pack 2019 for the most bang for your back. With a single subscription of this suite, you can protect all your devices (PCs, Macs, Android, and smartphones) with the high-end Bitdefender Total Security. If you are just interested in Mac-specific antivirus, Bitdefender Antivirus for Mac is the best option for you. It offers comprehensive anti-malware security along with a few useful utilities and options. If you’re interested in Bitdefender’s business solutions, click here to compare all the products in detail. Now, let’s look at what Webroot offers. The company begins its line-up with the entry-level Webroot Antivirus. A single license protects 1 PC or Mac. This antivirus package comes with an advanced firewall, a scanner that is updated via the cloud to ensure that all malware definitions are up-to-date, and identity theft protection. Plus, webcam protection and a secure browser are also part of the package. 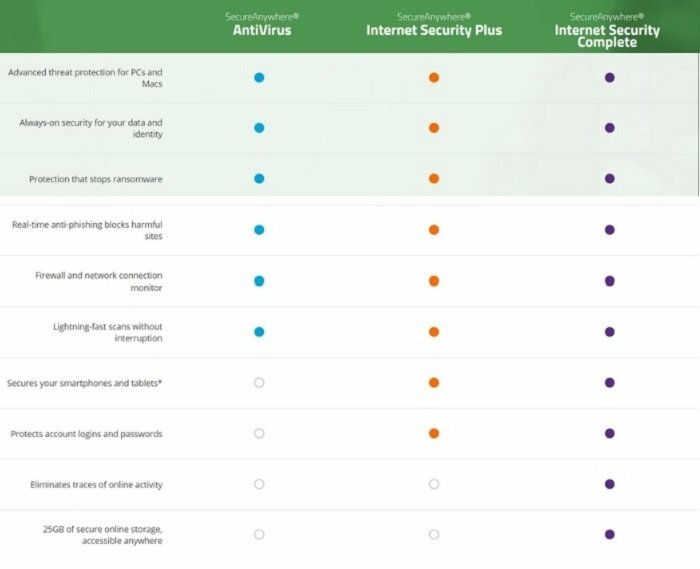 The next tier of coverage is Webroot Internet Security Plus. In addition to the security features that are part of the previous suite, this package just adds on a password manager tool. You can protect up to three PCs, Macs, or mobile devices with a single license of this suite. 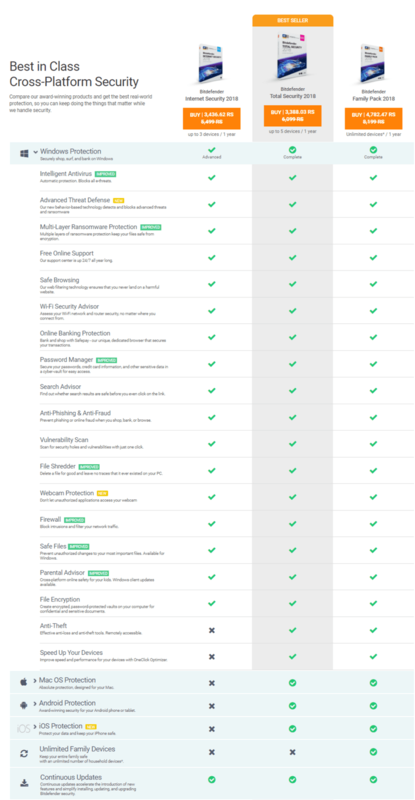 Finally, there’s Webroot Internet Security Complete, the multi-platform compatible security package. It comes with everything that the previous two packages offer but with three additional perks to make it worth your while. For one, it’s much better at eliminating your online activity, which can be handy if you need to browse without being monitored for some reason. The other two useful additions are the System Optimizer module and cloud space (25GB). A single subscription of this suite protects five devices of any type, including Macs and mobile phones. Interested in Webroot’s business solutions? Check out this link for more information. Winner: Bitdefender. Overall, although Webroot offers some great features that make it a strong competitor in the antivirus market, Bitdefender has a wider spread of more useful features and a greater selection of useful utilities. The biggest and most important aspect of any antivirus software is how well they protect your computer from malware. Malware, of course, refers to all types of digital threats, such as ransomware, spyware, rootkits, worms, and Trojans. Instead of looking at user reviews or the word of a company, we can use independent lab tests from unbiased organizations that compare all the top antivirus programs against each other to find out who is truly the best. To determine whether Bitdefender or Webroot is worth your money, we looked at recent test results from two well-known and trusted companies: AV-TEST and AV-Comparatives. When it comes to AV test and their rubrics, they test products from a scale of 1 to 6 in three different tests: Protection, Performance, and usability. The most recent two-round evaluations we can look at were conducted in November and December 2018. In the Protection category, Bitdefender showed its excellent malware protection capability with a perfect 6 out of 6 rating. Webroot, on the other hand, didn’t participate in the study for their own reasons. The last time Webroot took part in AV-TEST examination was back in 2013. It got a dismal 2.5 out of 6 in those evaluations. Let’s look at AV-Comparatives. The company’s recent Real-World Protection Test report was released in December 2018. 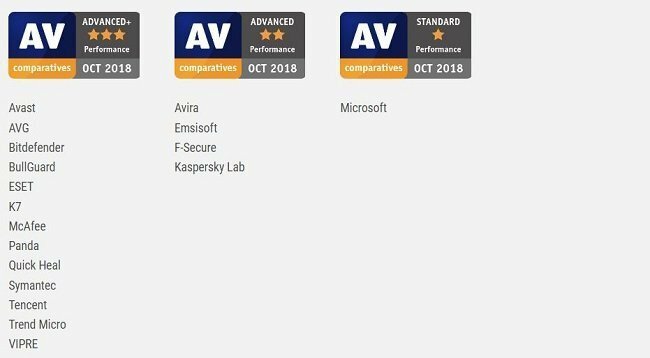 Bitdefender was among the few products that scored the highest possible ranking offered by AV-Comparatives, which is the ADVANCED+ award, while Webroot didn’t participate in this test, too. Winner: Bitdefender. Independent tests prove that Bitdefender provides excellent malware protection, while Webroot’s performance against malware is unknown. Another important aspect is how much impact a security product will put on your system performance. Thankfully, once again, we have recent independent tests at our disposal to determine which of these two companies is better in this regard. In the AV test’s performance examination, Bitdefender once again scored a perfect 6/6 rating. Meanwhile, Webroot, as mentioned earlier, didn’t participate in the recent AV-Test evaluations. It did score a six out of six in Performance in 2013. But we cannot trust such an old performance rating when the antivirus landscape has changed so drastically in the intervening years. AV-comparatives also conducts a performance test to measure the system impact of security software. In the recent version of the test, which was conducted in October 2018, Bitdefender got the highest ADVANCED+ award because of its low impact score. Webroot’s latest participation in the test was in 2012, and although it also scored the ADVANCED+ award, we once again cannot take that into account given the gap in time. Winner: Bitdefender. It’s clear that Bitdefender puts a minimal impact on system performance. If Webroot participated in the recent lab tests, it might have had a chance at winning in this category. We believe a good antivirus software should be easy-to-use for everyone, no matter if your computer literate or just starting to figure out how your device works. Let’s take a look at both antivirus software look. We will start with Bitdefender. Bitdefender’s main attraction is the Quick Actions which are enabled all across its interface. These are small tiles that can be changed or customized to act as “hotkeys” which you can bind to your preferred or most common actions. These are great for sticking daily activities or favorite scanning functions in the places where you can easily see. The autopilot setting handles everything on its own and applies all the necessary settings if you don’t like playing with the software. Furthermore, Bitdefender is even more customizable because you can make profiles or group actions and tiles into combinations to allow you to organize your tasks and scanning functions according to your personal routine or desires. The more you experiment with Bitdefender’s interface, the more you’ll like it. Now, let’s see what Webroot brings to the table. At first glance, Webroot’s interface looks outdated and unimpressive. But it’s simple and easy-to-use, which some people may prefer. Everything in its main hub is very easy to understand and access, and it offers tutorials and helpful buttons every step of the way. For this reason, it’s a great pick if you are not very computer literate. However, Webroot’s interface doesn’t allow you to change settings as often or as intensely as Bitdefender’s interface, which may prove frustrating for those who want to customize their experience or streamline their weekly security activities. Winner: Both. Bitdefender is better for folks who like more control over their interface, while Webroot will appeal to those searching for simpler antivirus solution. Another important facet of this competition to consider prices of both security software products. First, let’s look at what Bitdefender offers in terms of economics. Bitdefender Free is, of course, free right from the start, although you don’t get a lot of value from this package. The first paid suite, Bitdefender Antivirus Plus, costs $34.99 per year and protects up to 3 PCs. Bitdefender Internet Security, the next tier of software coverage, cost $39.98 per year. The multi-platform compatible, Bitdefender Total Security, is $44.99 per year and has licenses for five devices at a minimum and with a maximum total coverage potential of 10 devices. There is an additional Bitdefender Family Pack which is a great option for large families. It will protect all your devices (PCs, Macs, and smartphones) for $69.98 per year. Now, let’s see what Webroot charges for their coverage. Webroot Antivirus, costs $29.99 per year, is the most basic package offered by the company. Next up is Webroot Internet Security Plus, which costs $44.99 per year for three device licenses. Webroot Internet Security Complete, the most premium tier from Webroot, is $59.99 per year for five devices, and both of these packages include protection for mobile devices. Winner: Bitdefender. Overall, Bitdefender is more affordable and provides more bang for your buck. As one final metric for grading both software companies, let’s see how satisfied the customers of both companies are with their products. The Better Business Bureau (BBB) is an independent rating company that takes customer reviews and averages them out into a final score to see how people generally see the company. This is graded on A-to-F scale. Bitdefender has a C rating from the BBB, while Webroot has an exceptional A+ rating. Consumeraffairs.org is another popular customer complaint compiling website. It rates on a star scale. Bitdefender has four out of five stars while Webroot flips its position and has only three stars. Winner: Both. Overall, both companies are generally favorable and neither totally outshined the other in this regard. This is a tie. While it’s a close competition, Bitdefender provides a more robust feature-set and better overall performance than Webroot. Webroot isn’t thorough or affordable enough to challenge Bitdefender as a go-to choice for most consumers.